Did Zuckerberg just say Facebook’s working on News Feed Optimization? Summary: Zuckerberg hints at a new way of monetization through news feed — Flashback: Dave McClure’s hard hitting post on optimizing Facebook’s news feed for marketing — Justin Smith’s theory of Facebook’s News Feed Optimization (NFO) — prophecy fulfilled? TIME: Beyond Facebook’s exclusive advertising deal with Microsoft, which gives the software giant the right to sell ads on the site, what are some of your ideas about monetizing your 30 million users? 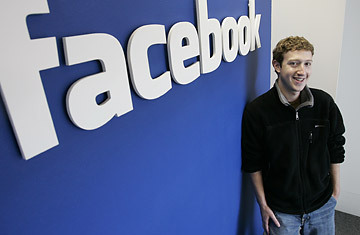 Zuckerberg: Advertising works most effectively when it’s in line with what people are already trying to do. And people are trying to communicate in a certain way on Facebook — they share information with their friends, they learn about what their friends are doing —so there’s really a whole new opportunity for a new type of advertising model within that. And I think we’ll see more in the next couple months or years on that. #4: Spend time optimizing the feed notification messages & app events that generate News Feed & Mini-Feed messages? ABSO-MOTHAF**KING-LUTELY. people check out feed info all the time, and when they do they see what their friends are doing. and they see what their friends’ apps are doing too. i’m 110% convinced that consistent & creative app marketing & event notification via the Feed is the key to unlocking the viral power of Facebook, not the wham-spam-thank-you-ma’am app invites that everyone is whining about Facebook dialing back down. the available inventory of feed notification messaging for your app — that is, your advertising inventory — is essentially limitless AND free, assuming people actually keep your app installed and use it. as long as users have your app running, their actions combined with app events will create feed messages & notifications that serve as constant marketing opportunities for your app. let me say that again: AS LONG AS YOUR APP REMAINS INSTALLED AND IN USE, YOU HAVE A LIMITLESS SUPPLY OF FREE ADVERTISING INVENTORY VIA THE FEED. get it? got it? good. Welcome to the new world of News Feed Optimization (NFO)–the new SEO for Facebook marketers. Optimizing your product’s News Feed items is the single most important thing you can do as a marketer on Facebook. Not only should Feed items be designed for optimal conversion, but they should also be invoked by your application in ways that will maximize their distribution. Zuckerberg: And people are trying to communicate in a certain way on Facebook — they share information with their friends, they learn about what their friends are doing. I would expect the user base will grow [and there will be] more ways for advertisers to reach people and communicate in a very natural way, just like users communicate with each other. All these things will just get more and more evolved. That certain way of communication is the infamous Facebook News Feed. Didn’t Pete Cashmore (Mashable) get tipped on something similar in September 2006 and called it (then) the worst idea ever? So, what do YOU think of the evolution of NFO? Prescient observations? I really believe that LinkedIn needs a widget inside of Facebook to stay relevant. I know quite a few bloggers that are leaving LinkedIn’s network to Facebook for a variety of reasons. Soon, users will use Facebook to find business connections as they don’t need to ‘pass’ along connections like in linkedin, they’re easy to find. Adapt and evolve LinkedIn, complacency is a killer. have to give credit to Justin on the “News Feed Optimization (NFO)” acronym… or Andrew Chen (or Babak Nivi?) on “Viral Marketing Optimization (VMO)”, but whatever we end up calling it, i do think this will become a whole new industry. in fact, it’s already happening. ps – i agree with jeremiah, hope you folks decide to bring all of LinkedIn’s juicy goodness into the Facebook world. Kudos to your excellent reviews along with those of Justin and Andrew. 1. Strengthen LI functionality, 2. Open APIs which we have announced already, and 3. apps on other social networking platforms. So, as far as LinkedIn opening a business app (in addition to the hiring app we’ve currently) on Facebook — it’s a matter of when not if, so stay tuned for more news. Thanks, bud, for the feedback. Much appreciated.